Yesterday I was home all day attempting to achieve some order in my bedroom, my calendar, my state of being. It’s always like this at some point as our fiscal year draws to a close (today!) and this time I was a little late to the task. I wrote checks to pay doctors who have kept me on a healthy path for another year, I shredded no longer useful papers and moved some to my file cabinet, responded to and deleted e-mails and did the accounting necessary to reconcile my part of our house expense budget. By 6:00, with some sense of accomplishment, I went downstairs to join again the world of conversation, having had enough of “business” for the day and feeling a need for some balance for my brain. I took up my knitting and Liz put down her book to talk with me so order was finally, fully restored. People tell me I’m “so busy” and I have come to recognize more clearly that I do have many irons in the fire, so to speak. I am realizing this morning, however, that it’s a question of attitude and approach to tasks that keeps life in balance. I am very blessed in where I live and in the life that has evolved for me. I could spin from one thing to another with only the anxiety of time constraints pushing me – as I occasionally do – or I could look at everything as I have described above – the necessary tasks and the lovely encounters all turning with the rhythm of the days – and simply be grateful for the gifts I have been given. It’s sometimes a delicate balance, but one that behooves us to notice, regardless of what fills our life. Surrendering to what is and willingness to “enter the general dance,” as Thomas Merton says, seems the way to maintain equilibrium on a daily basis. So now I go to meet my favorite dancing partner in my morning meditation. Have a blessed day, everyone! I know I have come to sound like a broken record that keeps repeating the centrality of the message of love that is reciprocal and unstinting but it appears again today in the readings for this feast of Sts. Peter and Paul. Jesus continues to ask Peter (and us) “Do you love me?” and then, receiving an affirmative response, directs him (and us) to feed people – to love people because of his (and our) love for God, keeping the energy of love flowing around the world and down through the ages. This, as I see it, is our task. This is merciful living, Godlike loving. This is the way to live. Today’s Scriptures add a postscript to my reflection of yesterday when I was searching for a lifeline in the midst of all the pain of the world. Akin to love, or perhaps a by-product of it, is the reality, the necessity, of trust. It shows up in the gospel of the storm at sea (MT 8: 23-27) as Jesus responds to the disciples’ cry to save them with the question, “Why are you terrified, O you of little faith?” They would have done well to remember what was probably one of their childhood “catechism lessons” repeated daily and appearing still as our gospel acclamation today: I trust in the Lord; my soul trusts in his word. (PS 130:5) The conclusion of that same psalm (vs. 13-14) is strong in its confidence that God’s care is with us in all things and will remain – if we choose to remain in God. It is enough for today. Let all who put their trust in you rejoice, for you take us in and give us shelter in your love. Your name becomes our shielding presence, our sure defense. In you we find our place secure and know your grace as home. This morning I’ve been searching unsuccessfully in all my favorite sources for a way to express what I can only describe as the pain of the world – but not a universal pain. There is that, but the sadness/distress that washes over me now is closer to home, residing in Albany, New York, West Virginia and California. It is about fire and flood, the fire appearing on east and west coasts and the floods devastating so many lives in between. “We’ve lost everything” is the refrain from those whose homes are reduced to ash as well as people – young and old – who slog through mud still waiting for word of loved ones who may have been swept away by angry streams or rivers. One cannot help but weep for their pain. At the same time there are images of store and restaurant owners who open their larders to feed the people in their towns who have nothing. Groups form to shovel mud and fold donated clothes for the needy while others come to pray their grief and that of their neighbors. I have watched news for months that tells of the devastation of a half-mile wide tornado or huge ice storm, but nothing has touched me as deeply as the past three days. Why is that? Are the losses greater or is it rather (or in addition) that a wider spaciousness for compassion is opening in me? Have the two brief reflections on mercy in which I participated during the last week sparked this response? Perhaps the energy shared at this weekend’s workshop here at the Spiritual Center, Windsor has had its effect on mine. As I sit bathed in the beauty of a fresh breeze and peaceful greening outside, I hear inside a familiar guiding word from the founding documents of my religious community: The Sister of St. Joseph moves always toward profound love of God and love of neighbor, from whom she does not separate herself…Perhaps I am coming to understand that oneness in a deeper way now. I wonder, then, what is the call of that truth? “More love,” I hear in response. “So much love!” How that call will manifest remains to be seen but I know it does not happen in isolation. It is only together that we can, energetically at least, save the world. Within the next 48 hours, I will spend time reflecting with about 100 people on the topic of mercy. In his short time as pontiff of the Roman Catholic Church, Pope Francis has electrified the world with his bold statements and writings on many topics and has manifested in his person and actions the love that runs as a theme through all that he proclaims. On December 8th of last year, Francis proclaimed a Jubilee Year of Mercy. The biblical understanding of sabbath stated that every seven years the land should lie fallow (resting the soil from the depletion caused by the crops) and after seven such cycles, the 50th year – jubilee – when people would also rest, “giving back” during which land was to be returned to original owner and captives were to be set free, the underlying intent being to restore right relationships and ensure that everyone had the means to live a productive life. We need constantly to contemplate the mystery of mercy. It is a wellspring of joy, serenity and peace. Mercy: the word reveals the very mystery of the Most Holy Trinity. Mercy: the ultimate and supreme act by which God comes to meet us. Mercy: the fundamental law that dwells in the heart of every person who looks sincerely into the eyes of his brothers and sisters on the path of life. Mercy: the bridge that connects God and humans, opening our hearts to the hope of being loved forever despite our sinfulness. We are at the halfway point in this jubilee year, past time to begin interiorizing the words – the deeds – contained in the above paragraph. One small act of compassion would be a good start (or conscious continuation) for our “mission of mercy” – something we would do or say to someone in need, even perhaps if that someone were ourselves. The news media were full of reports Monday about the rare occurrence of the Strawberry Moon on the same day as the Summer Solstice. How rare is it? The next time the two will be paired is in the year 2062. What the media neglected to delve into, however, is the spiritual importance of this full moon. Among the Seneca Indians (and other Iroquois nations) the rising of the Strawberry Moon heralds a sacred time. 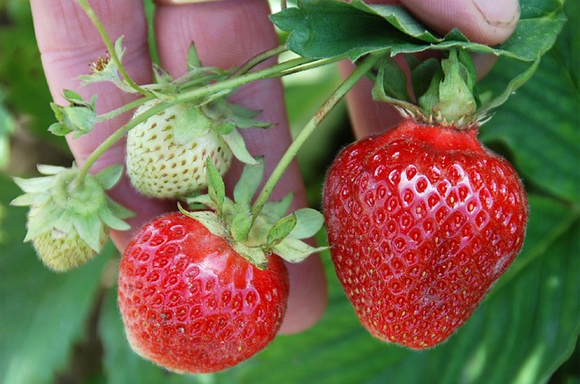 The strawberry is the first fresh fruit to be harvested after the long winter. To the Senecas, the fruit represents rebirth and hope. They believe you will eat strawberries when you die because they line the path to heaven. During this time, women and children are given the task of harvesting wild strawberries in special bark baskets. On the day of the full Strawberry Moon, the berries are pressed into a juice mixed with a little maple syrup and water. The entire village gathers for a festival that includes food, dancing and singing. The focus of the day is a ceremony in which the strawberry juice is shared with all. Before each person drinks of the juice, they express gratitude to the Great Spirit for all blessings received and surviving the winter. The juice was also thought to have invigorating healing properties because of its heart shape. Centuries ago the great Seneca warrior, Handsome Lake, entered into deep depression and drunkenness after the collapse of his culture following the American Revolution. Years later, one night Handsome Lake had several revelations in a prophetic dream that were inspired by the life cycle of the strawberry. From this dream he created a new moral code to strengthen his culture that included abandoning behaviors such as promiscuity and insobriety, confessing one’s sins and striving for salvation. His “Old Way” is still embraced as the “golden rule” today. In this morning’s gospel acclamation (John 15: 4A, 5B) the Lord promises “whoever remains in me will bear much fruit.” Inspired by the Senecas’ ritual of the Strawberry Moon, you might rephrase that to whoever lives a life filled with gratitude to the Great Spirit will bear much fruit. SOME OF THE PLANETS ARE HOSTING The ear becomes alert when music says, “I am over here.” The eye goes on duty, becomes viable, when beauty whistles and points to her dress on the ground. God has sent out ten thousand messengers announcing a great bash tonight some of the planets are hosting where the lead singer is God, Himself. But most of those courtiers have become drunk, got waylaid, disoriented to the hilt with such exalted news, and can no longer remember the time and the place. What does that have to do with you? Plenty. Hafiz will fill you in later if need be. WHAT IS THE ROOT? What is the root of all these words? One thing: love. But a love so deep and sweet it needed to express itself with scents, sounds, colors that never before existed. I guess I should try to pay more attention to this day. I wouldn’t want to miss another big bash! Somewhere in my possessions I know I have a 25′ tape measure. I come across it on occasion when I’m looking for something else but I usually can’t find it when I need it. If I’m trying to measure the size of something in my bedroom I often resort to using a sheet of paper since I know it is 8 1/2 X 11 inches. That works less well if what I need to know about is very small or very large and is only exact if the space I need is exactly consonant with the size of the paper so I don’t have to rely on holding my finger in the exact position of the edge as I move the paper with my other hand. It would be so much easier if I could find my measuring tape. In today’s gospel Jesus is challenging our tendency to judge people and the indication is that we should stop doing it in any case, mostly because we tend to do it haphazardly or without any sort of evidence to back us up. (MT 7:1-5) He’s basically telling us to look in the mirror of truth to see our imperfections (the wooden beam in our own eye) before we go about pointing out those (splinters) of each other. Our culture has taught us to be hyper-critical, I think, and some of us – myself included – have learned the lesson well. While it is true that we need to be discerning about our choices in our own lives, judging other people on surface evidence (or any evidence at all!) for any reason goes against everything we know of the teachings of Jesus. I’ll think of that today as I try to get a correct answer for whether or not a new computer stand will fit in the corner of my bedroom while I hear Jesus say: The measure with which you measure will be measured out to you.